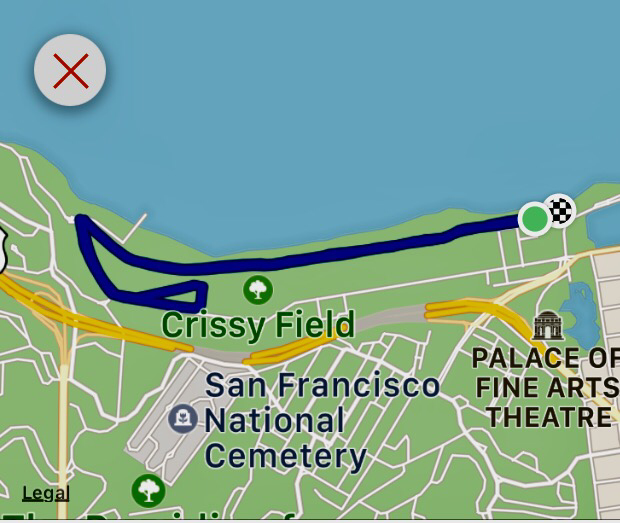 Last week (2nd Sept), while on a family holiday, I ran the Crissy Field parkrun in San Francisco. Even by 9AM the temperature was already baking. This was on the morning after San Francisco’s hottest day ever on record. My game-plan was to run the first two miles at 08:00 mins per mile & see if I could pick the pace up for the last 1.1M. The previous week had been spent in the mountains where all my runs had been slow due to the altitude & most had been of a run/walk nature due to the steepness of terrain, Not having run evenly paced miles for several days, I wanted the parkrun to give me a baseline for the half marathon training ahead. As usual I ran a couple of miles at a very steady pace to warm up & to check out the nature of the course. The paths were wide; the route flat; and the surface was mostly firm but with a thin layer of dust & sand to just be wary of. I drank a bottle of water with a hydration tab after the warmup & chatted briefly to several other runners. Well the results were a little inconclusive. There were a couple of mitigating factors, but it was disappointing not to hold 8:00MM pace. I will need to do a further test run, but it may be that my half-mara baseline should be set at 08:15. Run brief didn’t begin till way gone 9:00. We didn’t get underway until 9:16 (my watch). At my home parkrun we try to say GO bang on 9 & starting 1/4 hour late would probably cause a mutiny. This being laid-back West Coast & with a lot of runners being in holiday-mode, nobody seemed the least bothered by the delay. Most parkruns operate a very strict “No Barcode = No Result” policy. Here, runners without barcodes, were very much encouraged to enter their details on to a paper form, to be manually inserted into the results. Given that this run still needs to build a base of home support, I think this is a sensible exception to the rule, but one that may cause the organisers trouble in the future if numbers grow. The run-brief wasn’t held at the Start Point. After the brief we all mob-walked for a few minutes to the line & re-assembled. I presume this was to avoid unnecessarily blocking the boardwalk to other pedestrians & cyclists. 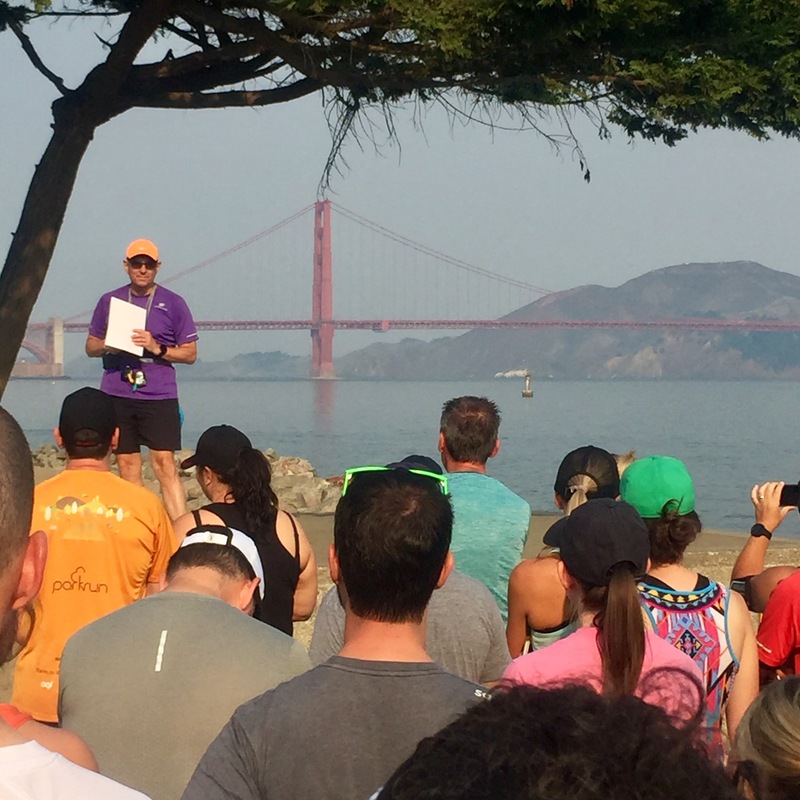 If you’re travelling to San Francisco, I highly recommend trying to arrange to be there on a Saturday & go-along to the parkrun. If you’re in good form & the weather is kind, this would be a fast course with definite PB potential. I reached the track into the park after about 0.75 miles of fairly unpleasant running alongside a dual-carriageway. There were also interesting rocky outcrops to clamber over & round. The trails were well marked, but not obtrusively so. Stunning views awaitedaround every corner & hairpin. No photos on the return leg. I concentrated on using gravity to my advantage & trying to find some “flow” over the uneven ground. Got a big Sportive in the calendar? Striving for a faster Marathon, sub-4, sub-3 even? Then what you need is a TRAINING PLAN. This is the received wisdom from all the cycling magazines, running websites, fitness trainers & sport apps that you’re ever going to come across. They all say you need a training plan, so it must be true. There’s a thought I’ve had for a while, that maybe, just maybe, training plans are not always the best way ahead. Maybe sometimes they are part of the problem, not the solution. Got any thoughts on this? Please do add into the comments. Do you think TPs are essential? Have you adopted any alternative approaches? Have you tried to follow a TP & become frustrated with it, or worse, beaten yourself up for not being able to stick to it? The role of Tail-Walker is probably the most popular volunteer option at my local parkrun. On the future roster, this position is usually filled several weeks in advance. Indeed, some weeks there is a veritable posse of Tail-Walkers, often accompanied by an array of children and dogs. Thus, despite having volunteered several times, Tail-Walker was one of the few roles I hadn’t personally tried. Around Friday lunchtime of last week, our volunteer coordinator sent out a message that she was still in need of a volunteer for Tail for the weekend. This was my chance, I grabbed it. 09:00 3-2-1-Go and 400+ runners were away. I watched them from the side-line calling out encouragement and I hung around a minute or two for late starters. Once underway, a gentle jog was all that was required to bring me up to the back of the field. I fell in stride with a gentleman who was new to parkrun and was using this as part of his recovery from a recent heart-attack. He had already completed some longer walks in previous weeks and saw the parkrun route as a good opportunity to progress, over time, from walking to jogging. For today he was happy walking and was maintaining a strong & steady pace. 09:03 The 1st bridge, is usually a bottle-neck when I experience it mid-pack, but from this vantage we were able to walk across unimpeded. The marshal gave us encouragement and in return I handed him a lollipop from the bag I was carrying. 09:08 As we approached the 2nd bridge, I could hear the marshal being advised by walkie-talkie of some late starters. I waited there to pick up the new back-markers. A lady dog-walker arrived from the other direction, I apologized in case she had been “swamped by a horde of runners” but she was in good spirits and seemed happy to have paused for a minute or so. She was even happier when I offered her one of the lollipops. As we had been advised over the radio, a “Young lady in a blue top” came through. The marshal & I cheered her on & told her she wasn’t the last. 09:13 “Gentleman with grey top, black shorts” aka the last of the late-starters came into view. And YIKES, he was flying! Full of apologies for keeping me waiting, he didn’t break stride and I did my best to keep up. I hardly had breath to reassure him that I really –gasp– hadn’t minded –pant– the wait at all. By the time we reached the next marshal, we were already seeing the backs of the next back-markers and also the front runners on the return-leg coming towards us. 09:17 Out of the woods, and starting round the lake. My companions now were Mum and Daughter. My guess, the girl was only 4, maybe 5 and for someone with little legs, she was making excellent time. Unfortunately, they were on the right-hand side of the path. This meant returning runners, now coming thick and fast, were having to swerve around them. At the first gap, I shepherded them to the left of the track. This gave them more space and, as runners approached, I was able to call out to ensure they didn’t even come close to being bumped. Their plan was not to run the whole route, but to turn early, when Dad & Older-Sister had been past. This they did, leaving me free to jog up to my next companion. 09:23 There was a paramedic crew waiting with the marshal at the far end of the lake. Fortunately, this didn’t herald an incident. They were there as part of setup for another event taking place later in the morning. I stopped for a quick chat and to share some more lollipops. They debated; decided I didn’t pose a stranger-danger and so gladly accepted my sweets. 09:27 Saw me reach the half-way turn-around point. The marshal here was the Event-Director from our junior event. She was fretting that she might have placed the magic turn-about-cone in the wrong place, causing the whole run to be too short or too long. With the authoritative power of my GPS watch, I was able to reassure that it was bang-on half way. Just to prove how well placed it was, I ran three laps of the cone. Allegedly at this time I may also have spread my arms out as wings and pretended to be an aeroplane. <edit> Apparently there is evidence of me doing this on YouTube. 09:28 My companion for the return leg, was wearing headphones and was clearly locked in to the music. There was limited opportunity for me to interact & offer encouraging words. I have no problem with this. If getting into a zone with some tunes is what it takes to keep putting one foot in front of the other, then I say go with it. I let my charge dictate the pace. We alternated between a fast walk and a slow jog. There were a couple of turns where, despite the marshals and the signs, we only stayed on course thanks to my wild gesticulating hand-signals, so I was able to provide some value. 09:52 We came into the last field with the finish line in sight, I had by this point acquired a handful of cones and several pieces of signage. We were accompanied by marshals returning to base. There was much cheering from volunteers and other runners as we ran across the grass and, with Cheshire-cat smiles, crossed the line. 09:53 By the scanning table, I caught up with my first walking partner of the day. Quite rightly, he was very satisfied with his effort and confided that he even broke into a gentle jog at times on the return leg. What did I take-away from my first Tail-Walk? From the outside, you may see 400+ runners all completing a 5K course, all doing the exact same thing albeit at different speeds. But that is not the whole picture. The people I traveled with on Saturday were each on their own specific & really quite different journey. This wasn’t one run, rather it was one point in time where 400 journeys intersected. Every week we sincerely thank the volunteer marshals for keeping us on-course and for making sure we all stay safe. This time, I got to see how the marshals’ words of encouragement can be like jet-fuel for their engines of the runners. Despite having been a marshal myself several times, I hadn’t before appreciated the full power of this. The World Athletics championships are underway (4th – 10th Aug 2017) in London. There has been some fantastic action but also much controversy. The bone of contention, as so often, is centered around drug use: The known; the suspected; & the rehabilitated. Justin Gatlin won the 100M beating, fans’ favourite, Usain Bolt. The crowd, well aware that Gatlin served two bans for doping offences, booed him before the start, on the finish line and at his medal ceremony. Other athletes who have missed tests or served bans have been politely cheered & applauded. Many of the spectators may have been unaware of the history of those individuals. However, as far as I know, no other competitors at this championships have returned after two suspensions. It may be the Track & Field supporters are prepared to give everyone a second chance but, unlike the IAAF, no more. I wasn’t there at the stadium, and I don’t usually react verbally to the TV or a Twitter feed. So I didn’t cheer or boo. How would I, how should I, have reacted had I been there? I hope I wouldn’t boo an athlete, any athlete. When all is said & done, they are human. In my view all humans, even the most truly villainous – those we lock away for murder or worse, should be treated with basic decency. It is not right to subject people to public humiliation. I may not agree with it, but the organizing body has ruled that athletes can serve a suspension and then return to the sport. While that remains the ruling, I believe those that do return, should be treated the exact same way we accord athletes we trust as completely clean. I cannot accept that it is reasonable to be banned twice and still return – but this is a failing of the organizers not of the individual. In Gatlin’s case, I would neither cheer nor jeer. It is much easier for the federations to downplay the booing than to ignore a deafening silence. And yes, I realize my silence can only be “heard” if everyone else chooses to be silent also. On one hand, I believe in the tenet that a person is innocent until proven guilty. On the other, given the weight of evidence, it is implausible that he is clean. We (the British) really want to believe in Mo, he could be, should be a role-model for our young, a success story that British Athletics desperately needs. Yet we fear to promote him as such, lest his superhero cloak be ripped away to reveal a pantomine villain. I think my truest response would be muted applause. But, when the drama of a race unfolds, it is easy to be caught up in the moment. That winning surge, the kick for home or a dip for the tape can throw emotions into sharp relief. Who then, can resist a cheer or a sob regardless of how the combatants may have journeyed to the start line? So much of elite sport is now clouded by the actual & suspected presence of drugs. Certainly WADA should be better funded, but they cannot win this on their own. Should the courts get more involved? Cheating at a professional sport is a fraud, one with significant financial implications. Should the sponsors be penalized if/when one of their stars is caught? This might have an impact, but smart organizations know how to capitalize on bad publicity. A tweet from Nice-Work alerted me to their newly published website. They are still at nice-work.org.uk but the site has been substantially modernised & updated. Good job guys. The course is all off-road & the HM is 2 laps. I haven’t put in an entry yet, but the date has been noted in my calendar. A mid-November race is good for keeping the motivation up as winter starts to bite. A few years ago I entered a 10K at Bedgebury hosted by the Marie-Curie charity. As I recall, it was a really good race on a challenging but very run-able trail. Hopefully this event will have a similar vibe.